JONATHAN STRANGE AND MR NORRELL: Episode 7 Review - The Other Side of the Rain | Warped Factor - Words in the Key of Geek. Tony Fyler awaits the return of English magic – on Blu-Ray. 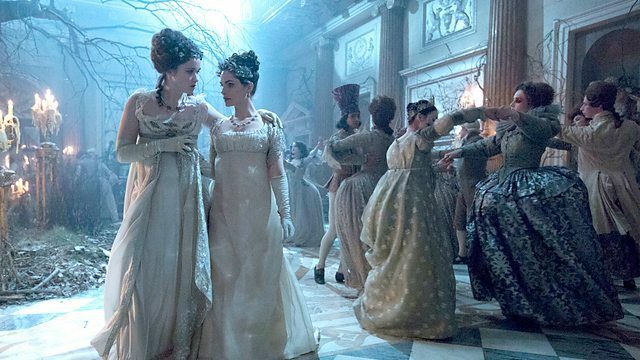 The pace of the final episode of Jonathan Strange & Mr Norrell dispenses with all quaint notions of build-up: from the word go, people are rushing around, being shot dead, and hatching hectic, demented plans to steal triumph from the jaws of tragedy. All the prophecy we’ve heard in the previous six episodes comes to pass here – the magicians succeed and fail, a king is made, a king is killed, and English magic returns, beyond the gatekeeping of its two great servants. What’s most pleasing about the whole unfolding of events is the journey on which Strange and Norrell themselves go – when Jonathan leaves Venice, Gilbert Norrell panics, improvises a labyrinth between his former pupil and the precious library in which he holes up, sure that Strange is coming to kill him. But Jonathan Strange proves himself just a little better than the dictates of Shakespearean tragedy, demanding not Norrell’s head but his help to defeat the Gentleman before that fairy king’s curse destroys him utterly. The two leading English magicians reach an accord, and even renew their friendship and summon the Raven King back to his realm. Not that all goes swimmingly, or that there’s much in the way of happily ever after about the climax of this epic story – there isn’t, and the tone is dark, stormy and furious all the way through this final episode, but the little moments between Strange and Norrell help to warm the whole tenor of the piece, and it’s particularly pleasing to see Gilbert ‘the rainmaker’ Norrell prove his worth as a magician with a cause, united with, we suspect, the only true friend he’s ever had. A particularly touching moment between the two involves probably the only remaining copy of Jonathan’s book on English magic – which, true to the man, Gilbert Norrell has kept for himself. The surprising strength of this final episode is its economy and balance – while the story belongs to Strange and Norrell, everyone gets their moments – the Poles, Vinculus, Segundus and Honeyfoot (who, to be fair to them, suffer a very unpleasant moment together for the sake of English magic), Belle Strange, Lascelles and Drawlight, the Gentleman himself, Steven, the nameless slave, and very notably John Childermass all get resolutions to their storylines within this last hour – it would be easy to call it a hectic sixty minutes, but that would be to miss the point: it’s about as hectic as a pocketwatch – it’s very full, to be sure, but everything has its space, its time, its tick and whirr and click and clack and tock in this episode, meaning it’s not so much hectic as scientifically crafted within an inch of its edit, leaving no real threads on which to hang a disappointment. In fact, that has been the very essence of all seven episodes – to cut a massive book with the scientific precision of a gem-crafter, bringing out themes through intrinsic characterization, making us ponder deeper meanings while still delivering the spectacle, the cut and thrust and conflict that both Napoleonic novels and magical fantasy stories should above all be about. It can only really enhance the careers of everyone involved, because it has been the kind of wild, engaging ride that, now it’s done, you just want to go right back to the start and take again and again. Particular praise must probably be heaped at the door of Peter ‘Kill The Moon’ Harness or his work in adapting the mammoth original by writer Susanna Clarke, and rendering it on TV is an easily accessible, devourable way. Eddie Marsan adds another in a long list of unsavoury, flawed human characters to his resume, and arguably in Gilbert Norrell, the most nuanced and complex of his career. Bertie Carvel, with his interpretation of Jonathan Strange announces himself to a wide audience as an actor to watch in anything, and Marc Warren proves he can dance on a dime and deliver quality menace alongside the nice guys for which he’s more generally known. And so it goes, down the cast list, there having been barely a foot put wrong in seven hours of glittering television. Perhaps the most intriguing thing is that the ending of the series did give a way in which there could be more Strange and Norrell, somewhere down the line, leading to a horrible dilemma: the cry of the geek is always for more, more, more – it’s why we invent and imitate, why we clamour for spin-offs, why to some extent we cosplay, to extend the magic of our favourite shows beyond the original bounds in which we enjoyed them. So part of me wants more, wants the series to go beyond the book on which it is based, to have a second season dedicated to The Return of Jonathan Strange & Mr Norrell. But the saner, everyday brain considers the artist, and how long it took Clarke to write the book, how long it took Harness to adapt, and the BBC to present it in this state of practical fantasy perfection. Perhaps, like the perfect meal or the perfect magic spell, Jonathan Strange & Mr Norrell should stand alone as it is, a classic that will repay another watch ten, fifteen, thirty years from now, a tiny slice of immortality, preserved by English magic.